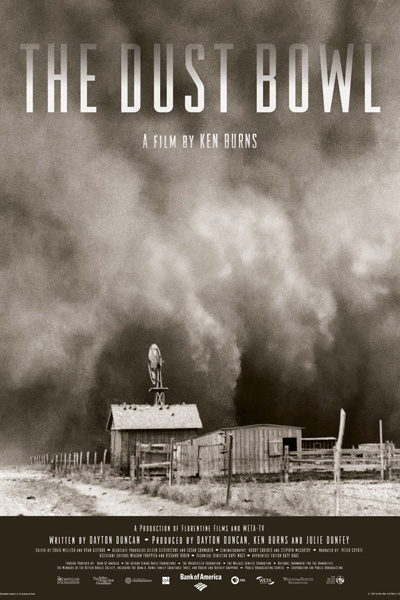 The Dust Bowl chronicles the environmental catastrophe that, throughout the 1930s, destroyed the farmlands of the Great Plains, turned prairies into deserts, and unleashed a pattern of massive, deadly dust storms that for many seemed to herald the end of the world. It was the worst manmade ecological disaster in American history. THE DUST BOWL chronicles this critical moment in American history in all its complexities and profound human drama. It is part oral history, using compelling interviews of 26 survivors of those hard times—what will probably be the last recorded testimony of the generation that lived through the Dust Bowl. Filled with seldom seen movie footage, previously unpublished photographs, the songs of Woody Guthrie, and the observations of two remarkable women who left behind eloquent written accounts, the film is also a historical accounting of what happened and why during the 1930s on the southern Plains.